Synopsis: Contrary to conventional wisdom, most of the influences that shape our self-image and world view occur spontaneously, usually outside our conscious awareness, during brief moments of soaring suggestibility. Recent neurological evidence shows how intense emotional events can create entrenched pathways in the brain that subsequently guide later behavior, automatically. 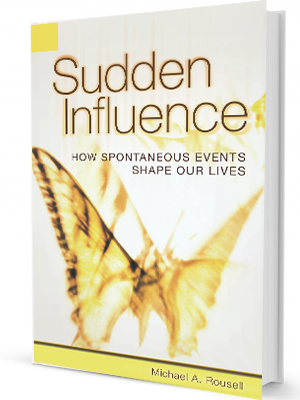 Using commonplace examples, anecdotes, and neurological support, Sudden Influence, teaches those interested in self-discovery and psychological foundations, how to recognize these previously mysterious Spontaneous Influence Events (SIEs) that shape us. Once recognized, we may then intervene to maximize potential benefits or minimize potential harmful effects. Causal remarks, such as those referred to in prefatory remarks by a U. of Oregon professor, can have a life-changing impact on a listener’s self-esteem. Based on extensive study of the phenomenon of spontaneous influence events (SIEs), a psychologist explains how SIEs can lead to new ways of thinking by disarming our usual defense mechanisms. Rousell’s treatment focuses on clinical and anecdotal examples, but he does relate the resultant elevated suggestibility state to research on the placebo effect. The book includes exercises to reinforce personal strengths. An easy read that includes numerous examples of “sudden influence events,” their perception, management, and overall importance in learning both inside and outside of the classroom. Occasionally bordering on a manual on how to manipulate potentially traumatic learning events, Rousell’s description of the role of hypnosis in education, and emphasis on the importance of creating linkages between information and feelings are timely and intriguing. Sudden Influence is an excellent invitation into the important and fascinating world of neurobiological learning and a valuable addition to every well-stocked, educational reference library. When he was a young student who hated school – and on one occasion “ranted and raved about the injustices of school and the inhumanity of teachers” – a teacher told Rousell that he could only change the system if he became a teacher. This statement/event had a dramatic, profound, and lasting effect on Rousell: he is now a counselor with a PhD in philosophy and professional experience in all levels of education. He has devoted 20 years to researching what he labeled the Spontaneous Influence Event (SIE) he experienced – a phenomenon many have experienced – and that research culminates in this present book. Rousell identifies five elements of an SIE: the perceived authority of the influencer, rapport with the influencer, dependence on the influencer, absorption in imagery on the part of the person influenced, and emotional arousal. These need not occur spontaneously, and the author presents a methodology in which these elements can be managed so as to create an SIE for the purpose of bringing out the potential in an individual. Including chapter notes, this is a stimulating, innovative, and practical book for anyone – teachers, counselors, parents, physicians, managers, social workers – working to tap potential in others. Summing Up: Highly recommended. All readers, all levels.